The First Ever Terrapin Cove Gift Shop at Forestdale! May 23rd was World Turtle Day and our 6 resident Diamondback terrapins must have been splashing their claws with applause as we hosted the first ever Terrapin Cove Gift Shop. This being the first year that all ten second grade classrooms were together at Forestdale, teachers joined together to headstart 6 diamondback terrapins. Teachers and students alike were eager to watch these fascinating reptiles grow over the winter months and anticipate their release in June. Meanwhile, Merrill Kennison, veteran teacher of 29 years, told us about the Audubon Society in Wellfleet and it’s effort to support diamondback terrapins at Terrapin Cove. That’s the turning point of this story. Enthusiastic colleagues began brainstorming ways to raise money and tie in our social studies standards of goods and services. This became the birth of an idea to create a store in which our 2nd graders were the producers and the kindergarten and first grade students became the consumers. Each 2nd grade classroom made “goods” to sell at the store that were all handmade by the students. 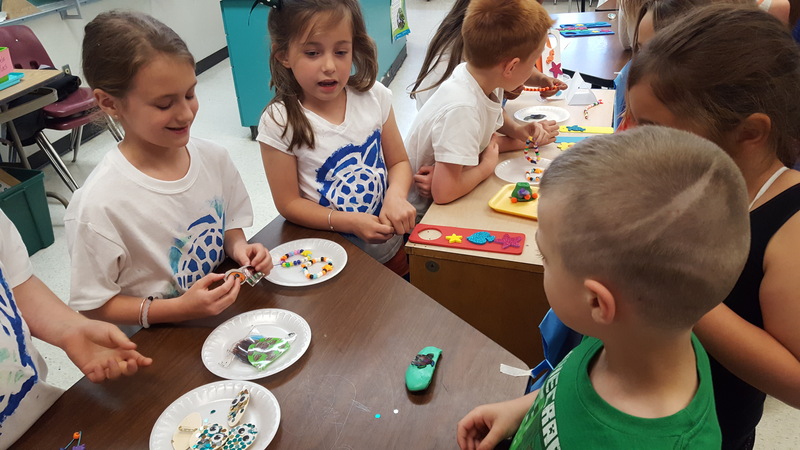 Everything from beads, egg cartons, Dixie cups and pipe cleaners were used to create clever crafts to lure our young shoppers, all for a whopping deal of 25 cents a craft! Students created posters to advertise the event and even created “live” commercials in each kindergarten and first grade classrooms to promote the gift shop! Then the scheduling gymnastics began to create work shifts for 200 students to sell their products at the Terrapin Cove Gift Shop (held in the science room) and welcome over 400 younger students to shop! Some students were the cashiers and quickly used their problem solving skills to make change when handed a $1.00. They proudly collected 3 quarters and said “75 cents is your change.” Some business-minded cashiers quickly added, “Or would you consider donating your change to our donations jar?” Our proud producers were even dressed for the occasion, donning their newly stenciled turtle t-shirts! It was such a group effort. We are so proud of what we accomplished together and how motivated our students were in this “project based approach” that covered so many curricular standards. More importantly, starting the Terrapin Cove Gift Shop helped the students and us work towards something that reached beyond the walls of our individual classrooms and even our school…we were working towards a broad goal of connecting with our Cape Cod community and our natural resources surrounding us. 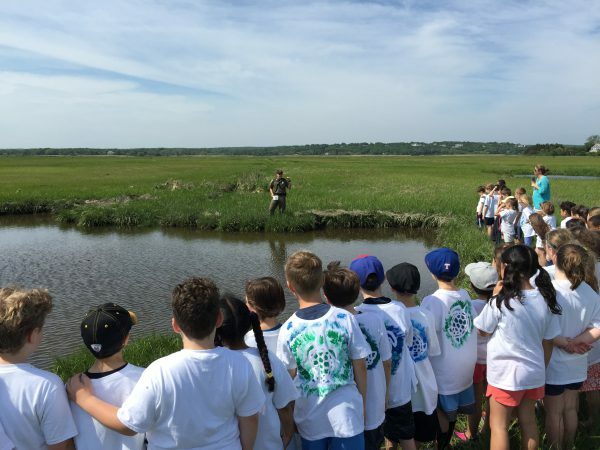 On June 13th, naturalists from Wellfleet Bay Audubon Society visited all ten 2nd grade classrooms and then graciously accepted our check of $312. Students saw how an idea becomes an action and how an action becomes a service to our community. 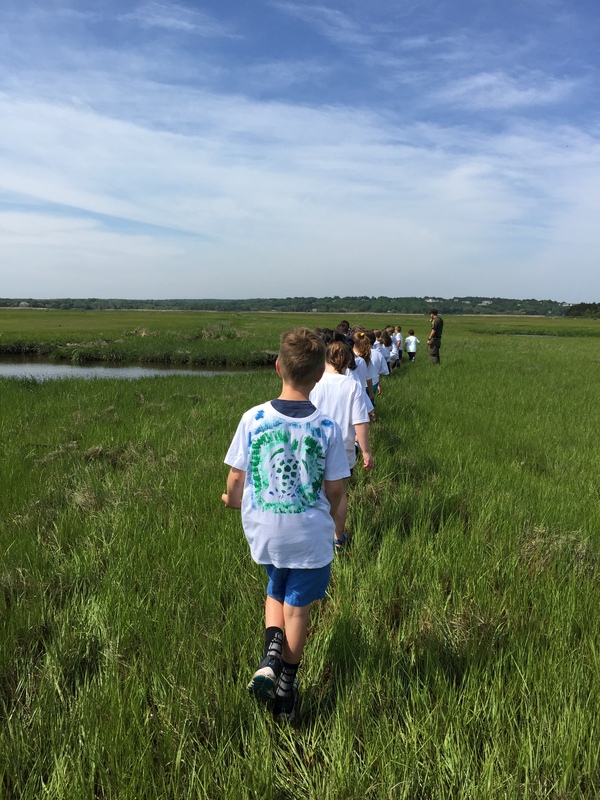 As students prepare to release their turtle friends into the salt marsh at Sandy Neck the last week of school (2 classes already released “Diamond” earlier in June), our second grade scientists will get to keep their love of turtles in their hearts.